During Our reign, We have labored unceasingly to provide the essential foundation for the future growth and development of the nation. It is with very deep and utmost regret that InI announce the transition of one InI stalwart Patriarch BONGO TAWNEY who has contributed in many many ways to the Rastafari Nation both nationally and internationally. Ancient Bongo Cecil Nyah Binghi is a eighty four old ancient, trodding from a long time, ova hills and valleys, rocks and mountains. He had faced many tribulations and hardships along the way, even today it is not an easy road. 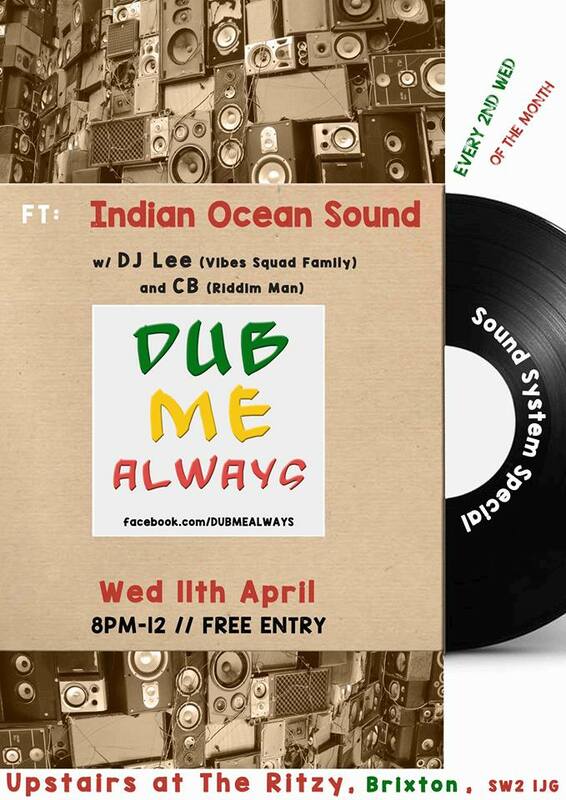 On Wednesday 11 April, Dub Me Always presents another sound system special, when guest selectors Indian Ocean Sound w/DJ Lee and CB the Riddim Man join host DJ David Katz for a night of reggae, rock steady, deep roots and foundation dancehall, original vinyl style. On the night, for your musical pleasure, Indian Ocean Sound will be selecting roots reggae on Disco 45s from the good old days—both JA and UK releases from 1970s and 80s, featuring toaster DJ Lee live on the mic; CB will be showcasing rare gems on 7” single and demonstrating his skills as a selector from the vaults of his musical library, for the pleasure of your dancing feet. As with this crew’s regular Reggae Time sessions, pure niceness is guaranteed!